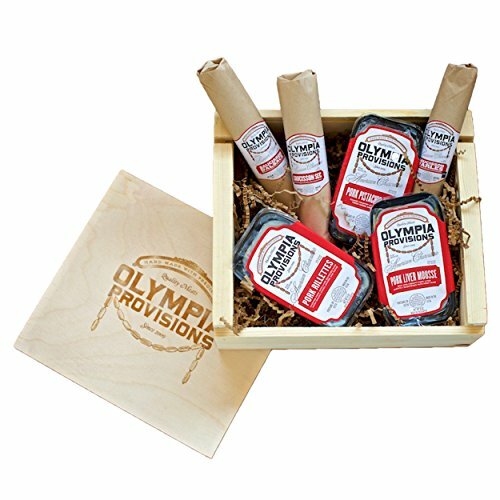 Olympia Provisions, an authentic and house-made charcuterie and meats company based in Portland, Oregon, began as Oregon's first USDA-certified salumeria and now offers food-lovers five Portland restaurant locations and online product availability nationwide. At Olympia Provisions, ingredients are our inspiration and we seek out the best and freshest. Treat yourself or guests to our artisan French charcuterie. Our party box is filled with a three different pâtés including: Pork Liver Mousse: Rich and creamy mousse of pork liver, slightly sweetened with Port Wine and capped with rendered pig fat, Pork Rillettes: Tender hand chopped pork shoulder slow cooked in pork fat with warm baking spices of ginger and thyme and Pork Pistachio Pâté: This country-style pork pâté is made with fresh herbs, pistachios, and capped with rendered pig fat. The charcuterie also includes three different saucisson salamis: Saucisson Sec (Saw-sis-SAHN SEK) is a traditional French salami flavored with garlic & black pepper, Saucisson D'Arles: Saucisson D'Arles (saw-sis-SAHN DEH-ahurls) is elemental, pure & simple: just pork & salt, Saucisson D'Alsace: Saucisson D'Alsace (Saw-sis-SAHN DE-al-SAHS) is an Alsatian pub salami flavored with clove, nutmeg, allspice & cinnamon. AWARD-WINNING - Artisan French charcuterie that is ideal for any party setting. SLOW CURED - French style meats slow cured for superior taste and texture. Made with fresh ground spices and herbs in a natural casing, and maintained in the organic white mold that protects them. PREMIUM MEAT ASSORTMENT - This party box includes a trio of pâtés including our pork liver mousse, pork rillettes, and country-style pork pistachio pâté, as well as three of our premium saucisson salami. ALL NATURAL - We butcher antibiotic-free Pacific Northwest pork to 100% lean, adding pure, soft fatback, and a judicious amount of sea salt, fresh garlic and freshly ground spices. TRIO OF PÂTÉS - This party box includes pork liver mousse, pork rillettes, and country-style pork pistachio pâté.